Card shuffle is the process of randomization of the deck that is applied to ensure that the element of chance presents in the card game. In case the deck is not shuffled in proper way players can sometimes guess what card will come up later, during the game and take advantage of this knowledge. Some casino card games don`t demand randomization of cards, experienced players often like truly randomized deck over other variant. There are lots of card shufflers techniques, invented by casinos, dealers and just by skilful card players. The pragmatic aim of those techniques is clear and explained above, but each of them has some peculiarities. Moreover, every type of card shuffling can be treated as the whole ritual (especially by inspired casino players) and requires from performers to become a skilled hand at this. Some of shuffling techniques are easy to learn and apply to the most common simple deck, while others can be applied only for special types of decks and require good training. One of the most common technique is riffle shuffle . It is frequently used together with so-called strip shuffle. Casino dealers consider such combination to be the best shuffling method. They also often combine 3 riffles and some strips in a gap between the 2nd and 3rd riffling cycle. Thus, it was widely called 'Casino Dealer's Combination'. This combination is generally accepted as adequate for regular play, due to the experts` opinion it takes 6 to 7 riffle-&-strip sequences for true randomization of clean deck. 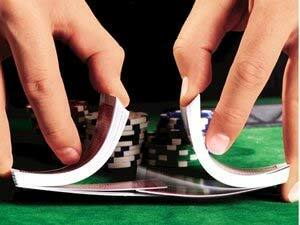 Casino cheating can be performed in shuffle easily by dealers as well as by dishonest players. In case of lasts it is possible while cutting cards and it is closely connected with Faro shuffle. Sleight-of-hand is the most common way for cheaters to demonstrate their skill. They can do fake shuffles and fake cuts when actually the cards order in a deck remains to be the same. 'Culling' is one more complicated method of cheating and it is very similar to 'stacking'. Using the first one player put desirable card on the bottom or the top while the second is used to create the situation when desired cards are dealt to you. There are also 'bottom deal' and 'second deal' that are used by cheaters. Considering all existing problems connected with cheating while shuffle it is necessary to mention automatic shufflers. No matter how clever and skilful are cheaters they cannot outwit the system and apply their tricks. And of course you are also safe from cheaters when playing online at www.gamevillage.com. Modern online shuffling algorithms are impossible to break. Shuffle Tech machines` system is based on the most reliable and time-tested type - hand shuffling. Actually this method is used by casinos in case of the highest stakes. Shuffle Tech offers 2 different ways of hand-shuffling: 'Full Randomization' and 'Casino Dealer's Combination'. The machines` design allows all players to oversee the process of shuffling.